I just saw the little mess for the first power on the army card ! Sorry - meant to reply to this. Thank you! A very early decision was that I didn't want her to be able to move, not normally - she is a plant, after all. Therefore, I decided that, to give her mobility, I'd play up the unknowable spirit angle and let her turn up anywhere near the enemy at the end of the round. Then I realised - if she's returning to the board like this, why don't I really play up the spirit angle and make her immortal? It doesn't make her unbeatable if she can come back like this at the end of each round - if she's gone when the rest of your army's eliminated, you still lose - but it does mean you can never truly eliminate her, which I was hoping would give her a nicely distinct, terrifying, otherworldly vibe. I could have made it automatic, or based on a D20 roll, but I decided - almost going for a reverse of Morwyn Rhoderyk - that basing it on the deaths of opponents' figures would make her feel more sinister. After that it was just trying to get across how she would hunt - Undergrowth Tendrils to tie her prey up and drag them towards her, and Helpless Victim to allow her to pick off those who are separated from the pack - and I had my concept. After testing her, I was honestly surprised by how happy I was with her - she felt evocative, ethereal and like nothing else in the game. After bumping her up 20 points on account of the fact I'd underestimated the power of her abilities, and altering Helpless Victim to be less punishing to heroes, I was ready to submit. One final small note about An Bláth - though lacking in explicit synergy, by counting as a tree and counting all spaces next to her as swamp water, she allows for plenty of subtle synergy throughout Classic and Mixedscape; benefiting the likes of the Marro Drudge, Water Elemental, Microcorp Agents and Aquaman (as well as the new Durgeth Ravagers, though obviously I didn't know that at the time) with her water; and the Quasatch Hunters, Poison Ivy, Floronic Man and Swamp Thing by acting as a tree. ~Lazy Orang, making acknowledgement to @Soundwarp SG-1 for the General and Homeworld. Last edited by Lazy Orang; October 12th, 2017 at 12:48 PM. The figure used for this unit is a Dungeons and Dragons figure from the Savage Encounters set. Its model number and name are #20/40 Greenvise Vine. An Bláth Dúnmharú does not start the game on the battlefield. At the beginning of any round, before placing Order Markers, if an opponent’s figure was destroyed during the previous round, whether An Bláth Dúnmharú is on the board, has not yet been deployed or is destroyed, you may remove all Wound Markers from this card and place An Bláth Dúnmharú on any empty space within 2 spaces of an opponent’s figure. All spaces adjacent to An Bláth Dúnmharú are considered swamp water spaces and whenever a special power on an Army Card refers to an Evergreen Tree or Jungle Piece, it refers to An Bláth Dúnmharú as well. All opponents' small or medium figures that enter or occupy a space adjacent to An Bláth Dúnmharú, and any opponents’ figures within 2 clear sight spaces of An Bláth Dúnmharú that occupy a swamp water space or are adjacent to an Evergreen Tree or Jungle piece, may not move, except to engage An Bláth Dúnmharú . 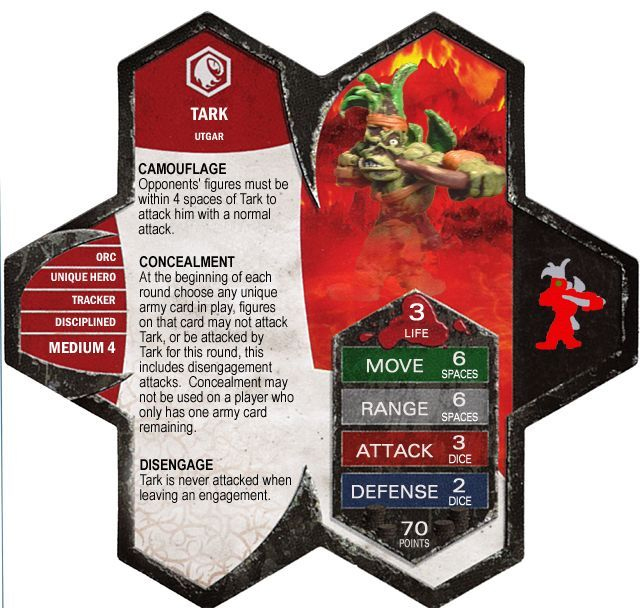 Figures affected by Undergrowth Tendrils cannot be moved by any special power on any other Army Card. Before attacking with An Bláth Dúnmharú, you may place any small or medium figure within 2 clear sight spaces of An Bláth Dúnmharú adjacent to her. If An Bláth Dúnmharú is only adjacent to one opponent’s small or medium Common figure, that figure may not roll defence dice against An Bláth Dúnmharú. If An Bláth Dúnmharú is only adjacent to one opponent’s small or medium Unique figure, that figure rolls two fewer defence dice against An Bláth Dúnmharú. As a Spirit, An Bláth Dúnmharú may be activated by Hanternos's The Ancient Hunt special power. As a Spirit, An Bláth Dúnmharú may activate Ganimorr's Carrion Birds special power. Disclaimer: Given the sheer number of powers that do not affect Large figures that go uncompiled, it is highly likely this list is not exhaustive and will not be consistently updated. The Customs I Use section is especially likely to contain gaps - if your custom is in my collection, would qualify but is not listed, I can only offer my apologies. As a Large figure, An Bláth Dúnmharú cannot be affected by aspects of certain special powers. These special powers include: Air Elemental's Swirling Vortex, Arkmer's Engagement Strike 13, Black Wyrmling's Fledgling Acid Breath, Braxas's Poisonous Acid Breath, Deathstalkers' Maul, Deepwyrm Drow's Poison Weapons, Drow Chainfighter's Chain Grab, Fyorlag Spiders' Entangling Web, Gladiatrons' Cyberclaw, Grimnak's Chomp, James Murphy's Whip 12, Jotun's Throw 14, Me-Burq-Sa's Paralysing Stare 16, Nakita Agents' Engagement Strike, Pelloth's Lolth's Wrath Special Attack, Rechets of Bogdan's Lethal Sting, Retiarus's Net Trip 14, Shurrak's Knockback 14, Wolves of Babru's Pounce Special Attack, Wyvern's Talon Grab, Zombies of Morindan's Zombies Rise Again. As a Large figure, An Bláth Dúnmharú cannot be affected by aspects of certain special powers. These special powers include: Arashara Goshiri's Shifting Sands, Augamo's Ramming, Hoplitron's Shield Push. As a Spirit, An Bláth Dúnmharú is not affected by Brishon's Sea Fret special power. Brishon is a design by my Mum. As a Large figure, An Bláth Dúnmharú cannot be affected by aspects of certain special powers. Current Special Powers that Interact Differently with Large figures. As a Large figure, An Bláth Dúnmharú interacts differently with certain special powers. These powers include: Fortress Door's Reinforced Defence, Shiori's Shuriken Special Attack, Torin's Battleaxe. As a Large figure, An Bláth Dúnmharú interacts differently with certain special powers. Current Special Powers that Interact Differently with Large figures. The Axegrinders of the Burning Forge roll one additional attack and defence die against An Bláth Dúnmharú thanks to their Fearless Advantage special power. Major J15 adds one automatic skull to whatever is rolled when attacking An Bláth Dúnmharú due to Breaching Scythe. An Bláth Dúnmharú may be replaced with a Zombie Hulk when destroyed by an Undead Savage due to Zombie Rises Again. Atom (Al Pratt) rolls one additional attack and defence die against the An Bláth Dúnmharú thanks to his Fearless Advantage special power. Last edited by Lazy Orang; December 13th, 2018 at 05:46 PM. Pseudo-seasonal update today - Vlad the Impaler and the Wallachian Infantry. This year, while looking over Warlord Games for figures for historical customs (I love history, and I hope to be able to put a lot more historical figures up here in future), I stumbled across these guys - and, knowing I already had Vlad, giving him some Wallachian troops to command was just too tempting to pass up (it's also what encouraged me to give Vlad a round of reworking). I changed Vlad's secondary class from Warlord to Champion (I was happy to give up Roman bonding, but not bonding with the Wolves of Badru - Vlad plus Wolves is a fun and thematic little army, even if it's not too strong) and gave them Champion of Evil Bonding off @IshMEL 's Sevestra Thune, a fun little character I picked up last year, since I reckoned that Sir Hawthorne could use another, more thematic bonding option and these guys would fit perfectly. I also reworked the initial concept of Harsh Example into a fairly different power and gave it to them, allowing them to hit pretty hard for a 4-man bonding squad, but at the cost of having to execute your own men - and, after a little testing and some painting of the Wallachians, I had a fun and thematic little faction. Last edited by Lazy Orang; March 30th, 2018 at 04:03 PM. 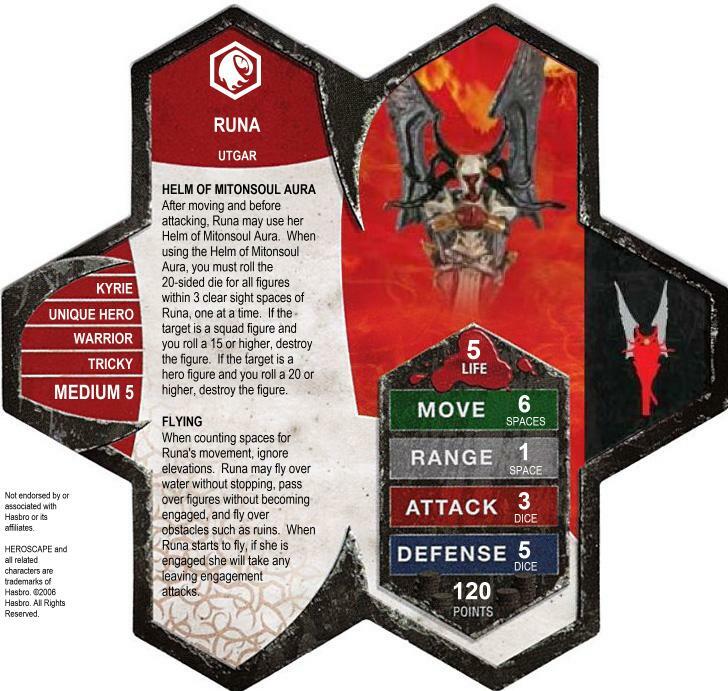 The figure used for this unit is a Horrorclix figure from The Lab set. Its model number and name are #300 Vlad the Impaler. Immediately before an opponent’s figure within 4 clear sight spaces of Vlad the Impaler would roll attack or defence dice, if that figure isn’t Fearless, roll the D20. On a roll of 15-18, that figure rolls one fewer die. On a roll of 19+, that figure rolls two fewer dice. Vlad the Impaler has the class Champion and the Relentless personality in addition to the class and personality listed on this card. At the start of the game, you may choose any Common or Unique Squad you control. For this game the chosen card’s personality is Relentless, regardless of what is listed on its card. Bio- Vlad III. Vlad the Impaler. Dracula. Few names brooked greater horror and revulsion in Eastern Europe in the 15th century. Few names were more feared. Having spent much of his childhood alongside his brother Radu as hostages in the Ottoman court, Vlad saw firsthand how ruthlessness and cruelty could be turned to a ruler’s advantage. After the murder of his father, the previous Voivode of Wallachia, and his elder brother, and the installing of a successor, Vladislav II, by the Hungarian court, he returned to his homeland twice - the first leading an Ottoman force, where he was eventually repelled, and then, years later, with Hungarian support, during which invasion Vladislav II was killed. At the beginning of his reign, he ordered hundreds of thousands of his own citizens executed, and began a purge of the boyars who had been involved of the murder of his father and brother - men he believed were plotting against him. Stories of his hideous deeds spread even during his lifetime - it was not long before he was a man of infamy. According to one tale, he once had two monks impaled in order to ‘assist them to go to heaven’, and even impaled their donkey when it began braying after its masters’ death - another tale said that when Turkish messengers came to pay their respects to him, but refused to remove their turbans, as was their custom, he reinforced said custom by nailing them to their heads. During his dealings with the surrounding kingdoms, he once broke into Transylvania and plundered the villages around Brașov and Sibiu, and when the Saxons confiscated the steel a Wallachian merchant had bought in Brașov without reimbursing him, Vlad responded by having some Saxon merchants ‘ransacked and tortured’. In 1460, Vlad invaded southern Transylvania, laid waste to the suburbs of Brașov, and commanded the impalement of all men and women who had been captured. When Vlad decided to end his vassalage to the Ottoman Empire, Mehmed, the Turkish Sultan, sent an official to order Vlad to come to Constantinople, while commanding another to capture him as he crossed the Danube. Vlad learned of this deceit, had them both executed, and then ordered, in fluent Turkish, the Ottoman commander of the fortress of Giurgiu to open his gates, allowing Wallachian soldiers to break in and capture it, to commence an invasion of the Ottoman Empire during which he devastated the villages of the Danube. More than 23,000 Turks and Bulgarians were killed by his order during the campaign. When Mehmed learned of the invasion in 1462, he declared Vlad’s brother, Radu, the new ruler of Wallachia, and invaded with a force more than 150,000 strong. Knowing himself to be horribly outnumbered, Vlad adopted a scorched earth policy as he retreated towards Târgoviște. After a failed attempt on Vlad’s part to break into the sultan’s camp and capture or kill him, the Turks reached Târgoviște - it was deserted, and they were appalled to find a ‘forest of the impaled’ - all but their sultan, who was, if anything, impressed. The Wallachians were defeated, Radu was installed as the new ruler, and Vlad fled to the Carpathian Mountains. He was soon captured and imprisoned by the Hungarians - rumour has it that, during his imprisonment, Vlad caught rats and cut them up into pieces or stuck them to small pieces of wood, so deep-seated was his cruelty. Vlad, having finally been released, moved to Transylvania in 1475. A year later, with support from nearby princes, he once again made war on the Ottomans, eventually returning to his throne in November. His third and final rule was short-lived - he died in battle against their counter-attack that winter. The Ottomans cut his corpse into pieces, and his head was sent to Mehmed. At least, that is the official story. When Utgar saw his merciless brutality, he knew this was one warrior he could not afford to ignore. On Valhalla, he is just as brutal as ever, laying towns to waste and making mountains and forests of the dead. Even in his brief existence on that world, his infamy has spread, to the degree that the enemies of Utgar fear him more than almost any other, for if they are captured, they know they can expect no mercy - only agony, followed by death. As a Human Champion, Vlad the Impaler may be activated by the Knights of Weston's Human Champion Bonding special power. As a Human Champion, Vlad the Impaler may be activated by the MacDirk Warriors' Human Champion Bonding special power. As a Medium figure with the Relentless personality, Vlad the Impaler may be activated by the Death Knights of Valkril's Unholy Bonding special power. As a Darklord, Vlad the Impaler may be activated by the Wolves of Badru's Unholy Bonding special power. As a figure with the Relentless personality, Vlad the Impaler may add one to his attack via Khosumet the Darklord’s Relentless Assault special power. As A Unique Human, a destroyed Ebon Armour may be placed on Vlad the Impaler's Army Card to replace Vlad the Impaler upon his own destruction. 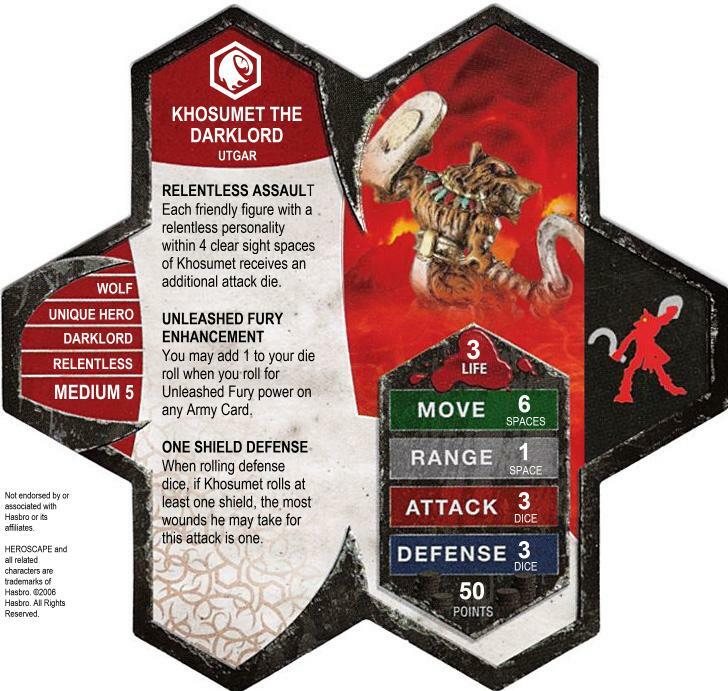 As a figure with the Relentless personality, Ulixes may add one to his attack via Khosumet the Darklord’s Relentless Assault special power. As a Champion who follows Utgar, Vlad the Impaler may be activated by the Wallachian Infantry's Champion of Evil Bonding special power. As a Champion who follows Utgar, Vlad the Impaler may be activated by Sevestra Thune's Champion of Evil Bonding special power. As a Unique Champion Hero, Vlad the Impaler rolls 1 additional attack die if she's Cecil Stedman's chosen Unique Hero and is taking a turn with Cecil Stedman's Government-Funded Heroes special power. As a Champion, Vlad the Impaler rolls 1 additional attack die when adjacent to Allen the Alien due to his Champion's Challenge special power. As a Unique Human Hero, Vlad the Impaler may be healed by Alfred Pennyworth's Field Medic special power. As a Unique Human Hero, Vlad the Impaler may be chosen for Arnim Zola's Cloning 16 special power. As a Unique Human Hero, Vlad the Impaler may be chosen for Jackal's Experimental Cloning special power. As a Unique Human Hero, Vlad the Impaler can be healed by Doctor Mid-Nite's Physician special power. Having a Relentless personality, Vlad the Impaler may aid the Knights of Blackgaard with their Relentless Army Attack Bonus. As a Champion, Vlad the Impaler may provide Cyborg (II) with a Justice League Marker through his Justice League Support special power. As a Champion, Vlad the Impaler may provide Batman (Bruce Wayne) (III) with a Justice League Marker through his The Brave And The Bold special power. As a Champion, Vlad the Impaler may provide Superman (Kal-El) (III) with a Justice League Marker through his JLA Trinity special power. As a Champion, Vlad the Impaler may provide Martian Manhunter (II) with a Justice League Marker through his Justice League of America special power. As a Unique Champion Hero, when Vlad the Impaler is destroyed, any unrevealed Order Markers on his card may be transferred to Sif through her Fierce Loyalty special power, and Sif may attack one additional time for the remainder of the round. As a Human, Vlad the Impaler allows adjacent friendly Civilians to roll an additional attack and defense die due to their Strength in Numbers special power. As a Unique Human Hero, Vlad the Impaler may be chosen as Rover's Companion with his Sentinel Companion special power. Templar Cavalry roll one additional attack die versus Vlad the Impaler due to their Righteous Smite special power. Last edited by Lazy Orang; March 29th, 2019 at 01:59 PM. The figure used for this unit is a Warlord Games figure from the Pike & Shotte line and the Wars of Religion set. The model name is Wallachian Voynik Infantry. After revealing an order marker on this card, you may first take a turn with a Champion who follows Utgar or Valkrill that you control. At the start of any round, after rolling for initiative, you may choose any Unique Hero you control who follows Utgar and destroy a Wallachian Infantryman you control adjacent to the chosen hero. For the duration of the round, all Wallachian Infantrymen within 4 clear sight spaces of that hero add one to their attack. Bio- For the men of Wallachia, fear is a constant part of life. The fear of the coming harsh winters - that the harvest may not provide enough food to sustain them through it, or that the winter chill will be too bitter, and claim the lives of their livestock, or worse, their loved ones. Fear of the Plague, still a recurring nightmare, striking and leaving villages decimated, bodies piled up in the streets. Fear of the Ottomans, the fiercely expansionist eastern empire to the south, who had already crushed the Byzantines, the last successors of Rome, and occupied their capital of Constantinople - who were already encroaching into the Balkans, conquering lands and demanding tribute. Last but not least, fear of their own ruler - Vlad III, the Drakulya, feared throughout Europe as one of the most bloodthirsty princes of a bloodthirsty age. They follow him because they must - because they know what an example he will make of them if they do not, and because they know his enemies will hardly be more lenient towards them, their lands and their families. On Valhalla, nothing has changed - these men, nearly killed in battles fought for their ruthless master, have been brought here at Utgar’s command, to fight for Vlad again. They no longer fight for their lands or their families - they fight because they have no alternative. Their master is the devil, and he does not brook dissension. As Soldiers, Wallachian Infantry add one to their move if you control Marcus Decimus Gallus due to his Soldier Leadership special power. As Soldiers, Wallachian Infantry add one to their attack when adjacent to Marcus Decimus Gallus due to his Soldier Attack Enhancement special power. * Agent Lilith, by @IshMEL (thread here). * Sevestra Thune, by @IshMEL . As Humans, Wallachian Infantry allow adjacent friendly Civilians to roll an additional attack and defense die due to their Strength in Numbers special power. Templar Cavalry roll one additional attack die versus Wallachian Infantry due to their Righteous Smite special power. Last edited by Lazy Orang; January 23rd, 2018 at 06:02 AM. Good heavens, you go into a lot of detail with the synergies and such! But still, Vlad + the Wallachians look great. I was going to query how they'd do vs, say, KoW, but Vlad's fear aura makes the WI (no, not the Women's Institute) that much killier (& so does being near a Skull Demon!). Thanks! I do try to be as comprehensive as possible. Unfortunately, the Skull Demon won't help them, as its aura only boosts Valkril figures... honestly, despite their fairly large number of theoretical bonding options, I'd only really take them with Vlad or Sir Hawthorne, since the Skull Demons and Orc Champions all have powers that can't benefit them, and these guys really don't do anything for the Orc Champions that Heavy Gruts can't do as well or better in that build. Still, Vlad and Hawthorne aren't bad bonding options - hopefully that forgotten, treacherous little knight will see a bit more attention when these guys are around. And here it is after I painted it. So, anyway... here's the card, made very kindly by @DanieLoche , who also did two options for her Winter Marker (my personal favourite is the top one, but I think they're both great), along with a short bio... well, more of a song really, I was feeling a tad experimental. Twists her fingers in the breeze. As snow blankets the ground. The winds of Rannveig clear the skies. The witch surveys the field. With eyes like chips of ice. Oh, and a little shout out to @Soundwarp SG-1 for her Homeworld, which will be Grymwold, and of course Magical Defence is obviously stolen from C3G, though I feel that it has its place in Classic too for magic users that are powerful enough. I'll likely get around to doing her Tome in the New Year. @Dr.Goomonkey , the cards you did me for the X-Series Cryo Centurion, Myji Coven and Dr. Gudruna Vogt have disappeared... don't suppose you could help me here at some stage over the next few days? Well... It appears all of the pictures I had stored on SumoPaint's cloud have disappeared. I've contacted support, but am not overly hopeful about getting them back. Morale: back up your files, kids. Since you have the card text right under everything I should be able to whip some new cards up within the next few days (probably tomorrow).